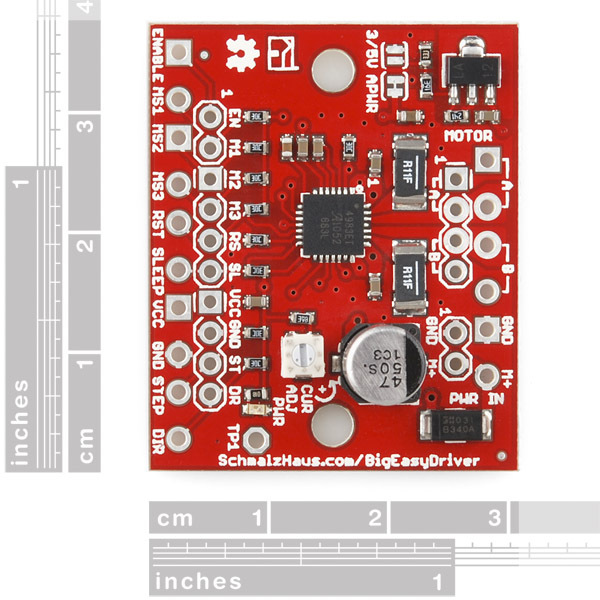 The Big Easy Driver, designed by Brian Schmalz, is a stepper motor driver board for bi-polar stepper motors up to 1.4A/phase. It is based on the Allegro A4988 stepper driver chip. It's the next version of the popular Easy Driver board. 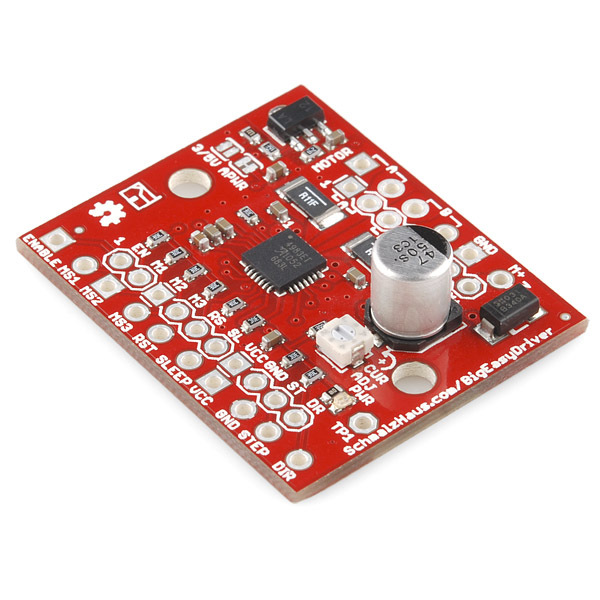 Each Big Easy Driver can drive up to about 1.4A per phase of a bi-polar stepper motor. It is a chopper microstepping driver which defaults to 16 step microstepping mode. It can take a maximum motor drive voltage of around 35V, and includes on-board 5V/3.3V regulation, so only one supply is necessary. Although this board should be able to run most systems without active cooling, a heatsink is recommended for loads approaching 1.4A/phase. You can find the recommended heatsink in the related items below. Note: The silkscreen on these boards HAS been fixed, we are just waiting on updated pics. Note that you can only get about 1.4A/phase out of this driver chip (even though it's rated for 2A/phase) without actively cooling it and heatsinking it. Even with those, it's hard to get close to 2A/phase. That being said, I've yet to find an application where 1.4A/phase wasn't good enough but 2A was. Normally, for applications where you absolutely need the very maximum torque of your big hoss motor, you're going to opt for much more robust and powerful drivers like Geckos. Also note that you can't damage this board by over heating it. (This is not a challenge. ) The driver and voltage regulator have built-in over-temp circuits that will cut out their outputs if they get too hot. You'll notice that the motor will start to 'stutter' if the chip gets too hot. Just back off the current adjustment pot in this case to send less current to the motor. Some users have trouble getting smooth microsteps. I always tell them to start with a nice slow pulse rate - maybe 10Hz or lower, and feel the shaft of the motor with their fingers as it's rotating. At 16x microsteps, you may feel there are some steps that are more or less powerful than others. Adjust the current limit pot, or increase the input voltage, if you have trouble getting smooth micosteps. Also note that if the coil resistance of the motor you have chosen is too high, the BED can't create microsteps properly. If you raise the input voltage, that will help solve this problem. Or just use a motor with lower coil resistance. Under normal usage, this driver can push a substantial amount of current through the motor - especially when it's not moving. The motor can and will get quite hot. I've not burned myself on a motor (yet) but I've gotten close. Be careful. Even at 1A/phase @12V, you're dissipating 24W in that motor. The amount of current you see being drawn through your power supply is NOT the same as the current going through the motor coils during motion. So if you're stepping, and you see 500mA being drawn from your 24V power supply, that does not mean that each coil is getting 250mA. You have to measure the TP3 test point with a meter, and use the formula in the data sheet to figure out the actual maximum current through each coil. Typically the current through the coil will be much higher than the current drawn from the power supply because of the chopper circuit on the BED. You can try that. And depending on the coil resistance of your motors, the torque you need, and your input voltage, it may work. However, that will present a lower coil resistance to the driver board, which may or may not be a problem. Another way to do it is simply take two BEDs, have each one power a motor, and run the same step/dir lines to both drivers. I've used this before to 'gang' any number of stepper motors. It could be. Do the Q13) checks on http://www.schmalzhaus.com/EasyDriver/index.html and see if you have any errors there. That should help you determine if you have a bad driver chip or not. I have seen a couple of people with this problem in the past. Sometimes it's a problem with their Arduino code (check your DIR pin with a volt meter or scope to make sure it's going all the way high and low) or grounding between the various pieces of the system. I am going to be using the PRT-11510 Small Heatsink. Where should I place it? On the top or on the bottom where all the thermal pads and vias are? It seems to me that with this design the bottom would be better. You can heatsink the driver chip on the top of the board, or you can heatsink the boar itself on the bottom of the board. Putting the heatsink on the driver chip itself will allow you get more heat off of the chip (since you're not going through the board), but if you have a large metal surface that you can attach the board to (with a properly electrically insulating thermal pad between) you may get even better dissipation. I see a few of these have been blown. Looking at the data sheet the equation for max current is I_max = V_ref / (8*R_s). The board schematic and features list say the current adjust pot will give you 0 to 2.4 Amps. However, if using the board at 5V logic level I get the max current to be 4.5 amps since you can put a max of 4V on the V_ref pin (unless the adjustment pot is limited) and the R_s resistors are 0.11 ohms. Now I'm sure it can't actually do 4.5 amps, but it's definitely allowing it to run completely maxed if not over-run. On the website the old version 1.1 has R_s values of .22 ohms and you can put up to 4.2V on V_ref. This setup works out to exactly 2.4 amps. What am I missing? Why the change? The resistor change was due to the need for reducing the power and voltage lost across the sense resistor. The smaller that sense resistor value, the more power goes into the motor, and the better we can make the microsteps at a lower input voltage. You are correct - if you crank the pot up high it will try to tell the driver to use more current than it's able to dissipate. What happens in this situation is simply thermal limiting - the driver chip rapidly cycles on and off, which will keep it's die temp down, and will produce a chattering or stuttering of the motor. This protects the driver chip. So you can't hurt the driver by turning the pot up too much. Note that the actual max current you can get will depend on your input voltage, current pot setting, motor coil winding and inductance and ability to remove heat from the board. So some people max out at 1.5A, and some max out at 2.4V or above. Cheese - you have good points. The resistors for Vref should be tweaked to give a better range. The notes on the schematic should be changed and amended to better explain how adjusting the pot controls the current. There are a lot of subtleties to this though that can't really be completely explained on the schematic and are, unfortunately, left up to the user to understand. For example, just because you set the pot at 1.5A doesn't mean you're going to get 1.5A/phase. It also depends on the inductance and resistance of the motor coil, as well as the input voltage to the BED. It will never be more than 1.5A if you set it there, but it may be less. SparkFun has begin using Github to manage design files (which is totally awesome) and I will work on updating the schematic at the very least to better explain. Thanks for the suggestion. I'm really sorry to hear you had problems with the BED. It sounds like it's best that you try other boards to see if you can get your system to work. Many people have constructed CNC systems using BEDs with no problems in the past- I'm very confident in the design itself. These little Allegro chips are quite sturdy. But because of the big powers involved, it is easy to make an innocent mistakes that can cause damage to the driver. You may have damaged the board, or it may have been defective. Have you contacted SparkFun? Yeah, the Big Easy Driver and the Gecko are in completely different worlds. Not only are their prices very different, but the Gecko can drive much larger motors much faster and much more smoothly than any little Allegro based solution like the BED. Totally different class. If you need to move big motors, don't use a BED, you'll be disappointed. If you need to move NEMA 17s or some of the smaller NEMA 23s, this should work out just fine. 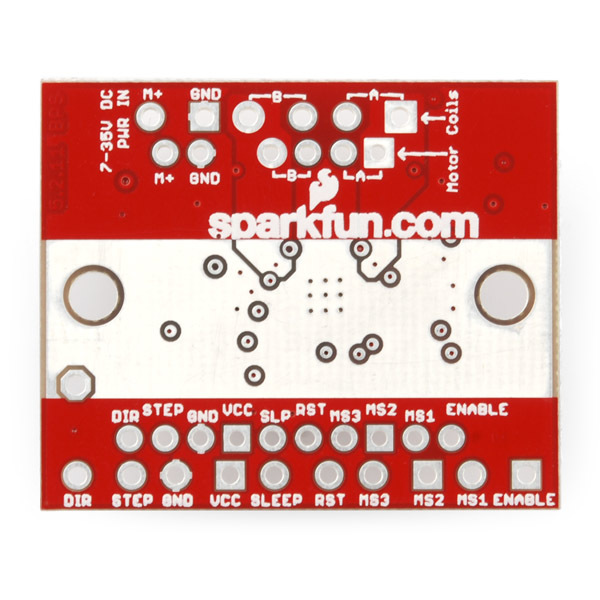 I'm really sorry that your BEDs died - but in almost every case that people have brought to my attention, some type of user error or mistake was found that likely caused the problem, not a bad board from SparkFun. They are pretty reilable, but if you have an instance where you NEED a geckodrive, the easy driver probably isn't the right product for you anyways. This is made for smaller steppers with limited current. geckodrives do have a LOT more protection, but most of the time you don't need it. plus, a geckodrive is $120+. apples to oranges. No- the motor you have listed will draw much too much current for the B.E.D. to handle. The Big Easy Driver can only supply up to 1.4A per phase. Try the AutoDriver. That should work from the specs you've given. Though you should double check for yourself. Sorry to hear you are having problems with your set up! I recommend contacting techsupport@sparkfun and walking through your set up with them. Because the motors you were using are unipolar, it'll be important to ensure you have everything hooked up properly. They'll be able to help you out with all of that better than we can in the comments. I've noticed a few comments here lately from people who had trouble with the BED. Therefore, I am going to add my experience to the official record. I bought two BED's in the past 3 months (about a month apart.) One of them worked perfectly, but the other behaved much like those described in posts below: choppy, inconsistent motion. Note that I have been able to precisely compare the two BED's with the exact same motor and hook-up (NEMA 23, 1A and 7.4V per phase). Just prior to my posting this, the defective board went up in flames (literally). To whomever it may concern, it might be time to investigate whether a particular batch of BED's is flawed. Yes, I've seen many people solder in the 3.5mm pitch screw terminals. They work great. I've also done it a lot too. Unfortunately, the A4988 driver chip has a maximum voltage of 35V. Using 36V might work, but you would be beyond the 'absolute maximum rating' as per the datasheet. It sounds like your motors are compatible - however you won't be able to get anywhere near the fully rated torque out of them with the BED. That may or may not be a big issue depending on exactly how you're using them. The 2.8A means 2.8A/phase. Have you measured the maximum HIGH voltage on the STEP and DIR pins from your PLC? If they are over 5V, then they may have damaged the BED. Your resistors should have prevented that problem, but measuring it (without the BED in place) would be a good double check. if you disconnect your motor from the BED and then power up the BED, do you still see the same LED pattern? Unable to purchase Probotic Side Step boards because the driver chips are no longer available I needed a replacement. I examined the Pololu item #: 1183 selling for $9.95 using the same Allegro A4988 as Sparkfun's Big Easy. I selected the Big Easy because it provides mounting holes and by using a connection to TP1 it is easy to connect an external pot to control the stepper motor current. I bought two of these for use with a Raspberry Pi. It took me a while to get it set up because I didn't think it could be as simple as it is. All it takes is a PWM output to control the steps. I wrote a short line of code in Python using the RPi.GPIO library and had this up and running in a few minutes. 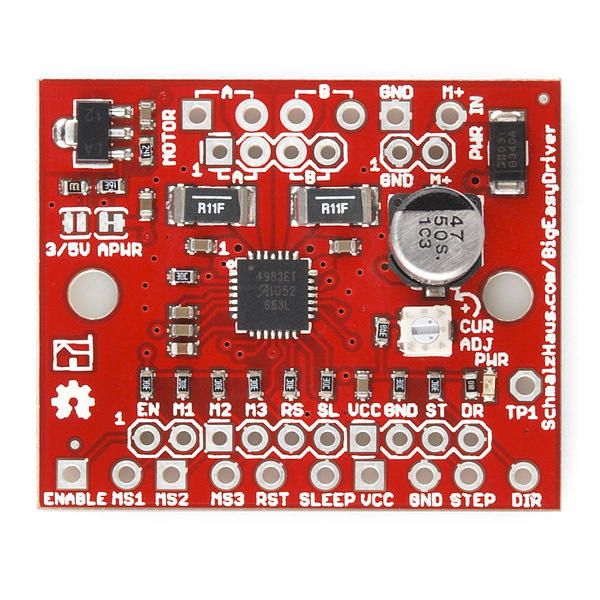 I'm sure that you lose out on some of the higher level functionality that you get with a bigger more expensive driver, but for $20, this is a great product for someone who just wants to run a small-medium sized stepper. I would definitely recommend this and will probably buy it again for myself. I tested it out the other day with an MSP430 launchpad and a small stepper motor. Worked as advertised. It really is easy to use and you don't need many processor pins to run it, especially if you don't want to change the step size programmatically. I would recommend this to anyone that needs to drive steppers with ease. I have no complaints, allowed to easily hook up my first stepper motor ever. No muss, no fuss. I ordered three of these units and have not yet received them! It seems that UPS sent them to the wrong post office and from there they are "missing" I called Spark fun and asked what to do about this and the guy said that they were shipped economy class and that there was nothing he could do if they did not arrive. He did say that he would refund my shipping costs but because I chose the free shipping option, there was nothing to refund. I hope this is not typical of this company. I would think they would try to track down their customers packages if there was a problem. VERY disappointed. I'm sorry that there was some difficulty with your shipping method! Sometimes there is a delay when UPS transfers the package over to USPS and it looks like in this case they sent it to the wrong post office which caused an additional day of delay. I am showing now that it has been delivered, so please let me know if that is not the case by emailing cservice at sparkfun dot com. I appreciate you reaching out to us and please keep in mind that we can help you much faster if you send an email rather than letting us know in a product review.